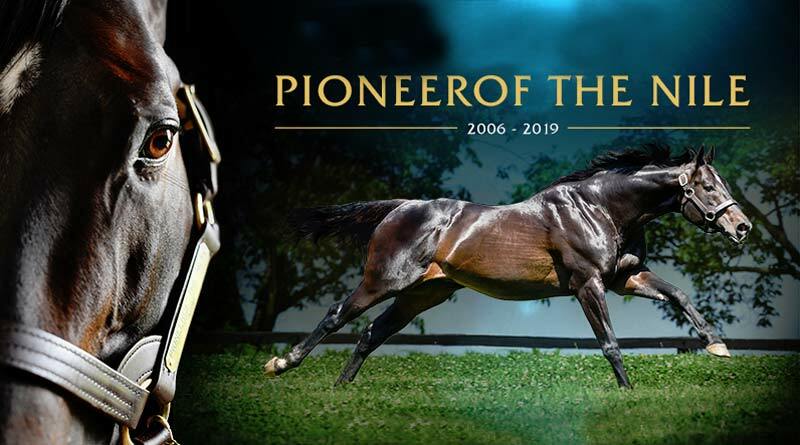 Triple Crown sire and group one winner Pioneerof the Nile has died suddenly at the age of 13 at WinStar Farm in Versailles, Kentucky. The farm reported that the sire of 2015 Triple Crown winner American Pharoah bred a mare on Monday morning and then “started acting uncomfortable” once he was back in his stable. He died en route to a veterinary clinic. The leading money-winning son of Empire Maker and heir to the classic Fappiano sire line, Pioneerof the Nile won four consecutive Graded stakes, including the $750,000 CashCall Futurity [G1] and $750,000 Santa Anita Derby [G1]. Runner-up in the Kentucky Derby [G1] in his first start on dirt, he excelled on all three surfaces – dirt, turf, and all-weather. As a sire, Pioneerof the Nile (Empire Maker x Star of Goshen by Lord at War) was an outstanding commercial success. His 2018 yearlings averaged $353,952 (2017 yearling average: $328,413), while his 2018 weanlings averaged $617,500, including a $1.9 million weanling at last November’s Fasig Tipton sale, the highest-priced weanling ever sold at that sale. Some 46 of his sales progeny have fetched $500,000 or higher. Pioneerof the Nile was among the first thoroughbreds bred by Ahmed Zayat. He had bought Star of Goshen in 2005, when she was carrying Pioneerof the Nile. Pioneerof the Nile’s stud career kicked off at Vinery in 2010 and he moved to WinStar in 2013, where he stood for $15,000. By 2019, his fee had risen to $110,000.